Although let's face it, I never really wanted out. Apple on Tuesday reminded the world why they're the most innovative electronics company in the world, and reminded me why I'll keep drinking the apple-flavoured Kool-Aid. Forget the iPhone 6 and 6 Plus, one of which I will absolutely be shelling out for as an upgrade to my iPhone 5, the big news out of Cupertino was the Apple Watch. Here's the thing with Apple: So much speculation leading up to their product launches usually results in a slightly disappointing experience when the rumours are mostly confirmed to be true. But while we all knew the Apple Watch, or iWatch, was forthcoming, I doubt anyone expected what CEO Tim Cook announced Tuesday. The naysayers will denounce the fact you must own an iPhone for the iWatch to work properly, but that's just smart business. For me, things like an on-board heart-rate monitor and the ability to track how active you are throughout the day are both impressive and important to getting more people moving. Most notably though, the Apple Watch is the first smart watch that doesn't look like something out of Star Trek or like one of those calculator watches popular in the early 1990s. 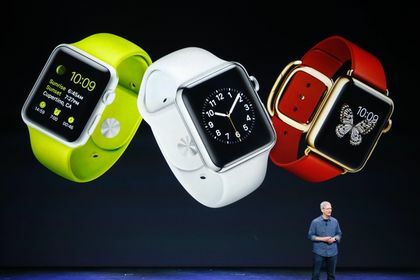 The Apple Watch has two sizes, three finishes and a variety of wristbands, which will all combine to make this massively popular. From what I can tell, Canadian reaction to the news Tuesday went one of three ways: People were very excited; they couldn't care less; or they inferred it was anti-Canadian to like Apple products. “I hope you spend as much time on the new #Blackberry#Passport in a couple of weeks,” wrote one of my Twitter followers. Let's face it though, I won't. Here's the thing: If Blackberry were still making products that people actually wanted to stand hours in line for, I'd be far more interested. The problem is they just don't. Apple sucked me into their empire with the first iPhone in 2007. I bought one in the U.S. before they were available in Canada and figured out how to make it work here. Since then, I've owned a 3, 3G, 4S (which was stolen by a couple of little punks at a Starbucks in Niagara Falls) and now a 5. I don't love everything Apple makes, which is why I still prefer PC computers, but my personal feeling is there's no phone on the market that can touch the iPhone. If that makes me somehow less Canadian, then so be it. Would you consider buying an Apple Watch?